Replay mode is added! Tested as working with my Think Vape Finder 250c. Please give the theme a rating/review if you like it. Thanks! Love the Theme on my Therion 75C. Only one thing you said it would display multiple battery cell voltage. On my Therion it only displays 1. The device has 2 cells tho....? Anyway thank you for the well put together theme. Really nice job! Keep the nice work ON! 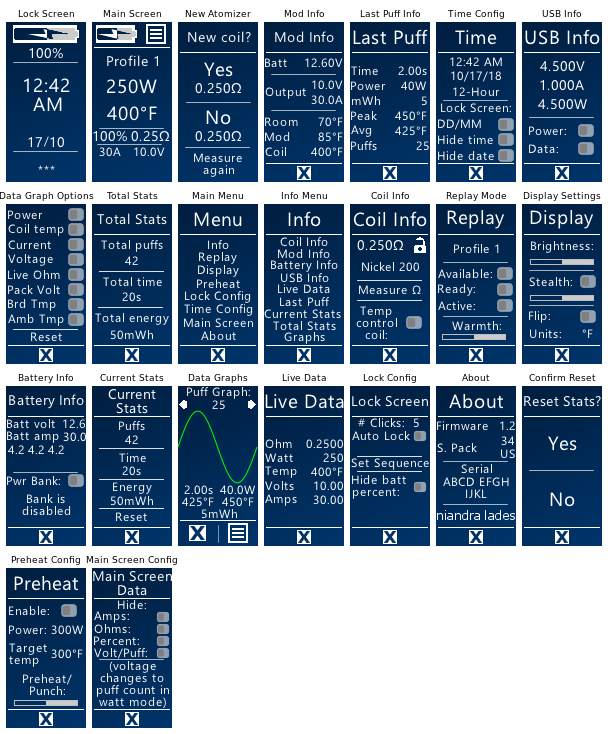 @RMoniz How many cells do you see in Device Monitor on escribe? @niandra3 You should be able to use that 'cell condition < 2' to differentiate between 75C's and 250C's. Example, If it's 1 show text saying this is a 75C and hide power bank options. IMHO 75C's will always identify as 1 cell. 250C's will NEVER identify as 1 cell. But that's a good idea about hiding the power bank stuff, I'll add that. Just to confirm, if there's less than two cells (or if it's a 75c), power bank mode is unavailable? You've missed my point. The 75C is a parallel board, and 1 or more cells probably will only ever show as a single cell. If @RMoniz answers my question we'll know for sure. Just to confirm, if there's less than two cells, power bank mode is unavailable? I would say correct. No OTG option and a few other things that are 250C specific. @Wayneo ahhh I see, thanks. Yeah the docs are severely lacking, but I guess we'll figure this all out together. Thanks for the info. Is this a valid statement -> IMHO 75C's will always identify as 1 cell. 250C's will NEVER identify as 1 cell. Is there a more elegant way for Theme Designer's to differentiate board types? To test Power Bank support, the condition you want is Miscellaneous -> USB -> Power Bank -> Capable. 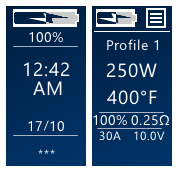 1. it seems with DNA250c devices, in EScribe you can configure 2,3,4 battery cells for your device. This is reflected in Theme Designer since you can get individual voltages for each (see my theme above). But @RMoniz above didn't seem to be able to see the voltage for his second cell in his 75c in my theme. And in EScribe it seems there is no info about how many cells there are for a 75c device. So our guess was that DNA75C devices, is it just defaulted to a single cell due to the way the batteries are wired, with no options in EScribe to define 2,3,4 cells, etc? There are some 75 devices with 2 cells, but it doesn't seem that you can individually address them in a Theme. 2. Is there an easy way in the Theme Designer to determine if a device is DNA250c or DNA75c? Is that what you meant by the power bank support suggestion? Does that mean 75c doesn't support power bank so that is a good way to tell which board it is? @John Any thoughts on my 2 questions here. 3 posts up. Not getting Replay to work on my Hcigar VT75D. I love this theme, the layout is perfect for me but I cannot get Replay to work with this profile. Works fine with the default profile. If I go into the Replay menu, I am unable to change the status and it never shows as available. Also, a minor note, Wattage mode is changing in 5 watt increments. Easy enough to change but I thought I would point it out to you. puff counter reset is not working. when i choose yes and press middle button, nothing happens. i can't figure out the fix, but maybe you can. @hawk256 Thanks for the info. I will do some testing tonight on my 75 and get back to you. Works great on my 250. There are some firmware issues with 75 and the international version and such, but if it works on the default theme I should be able to fix it on mine. I'm planning on restructuring the replay implementation anyway. 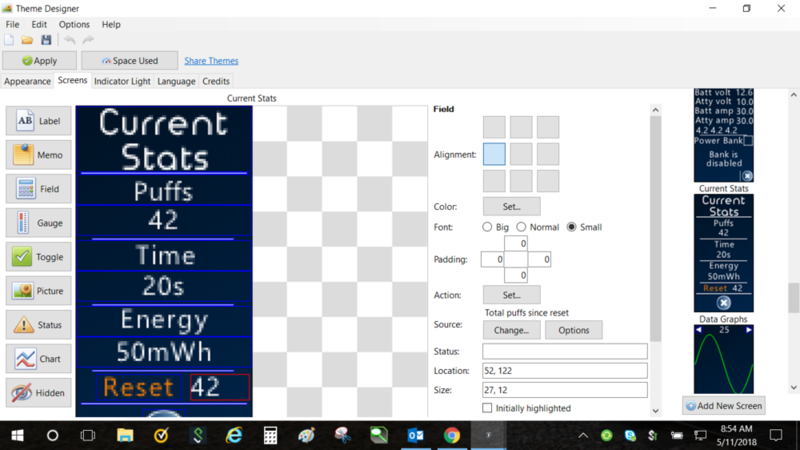 Going to try to get it on the main screen so it's easier to save your puffs without having to dive into the menu. As for the wattage, I think I prefer the 5w increments, so I used that. do you prefer something different? @Ronbon172 thanks..I saw your review and was going to reach out. I stupidly never tested that feature. But it looks like I'll be releasing a new version of the theme tonight so I'll be sure to get the reset working. Thanks!! @Ronbon172 ok I am a total idiot. There are total stats, and resettable stats. All of the stats on the total stats screen are not resettable. So I'm going to make a second page to keep track of both (ones you can reset and ones you can't). New version out tonight with a lot of improvements. Thanks for catching this!!! Ok everybody, I've made some changes and want to release an early beta. Don't have time to really test it tonight, but some of you asked for features so I want to release something. Here's a beta of version 1.4. Replay stuff moved to main screen, and the reset thing fixed (only stuff on the new Current Stats screen can be reset.. the Total Stats can't be reset). There's a lot of other cool stuff in here but I just wanted to get this out there before the full release which is probably tomorrow (May 11). @hawk256 The Replay is working on my 75c. I'm using the new "Escribe Early Service Pack (all devices): Suite 2.0 SP 15.1 (International Edition)". Then using that I updated my 75c device to firmware "1.1 SP33.2 " (that should pop up once you connect your DNA to the latest Escribe). With that firmware on my 75c, the Replay is working for me (and you were right.. it wasn't working before). See attachment for latest version (v1.4beta). Please let me know if you have ANY problems, I want to release the final version as soon as possible. Thanks!! I could also use some feedback about the Replay implementation on the main screen. The check box means you have a Replay compatible profile/coil. Then when Replay is available, the button turns green. Then to leave replay mode, press the Cancel button. If you guys don't like it or have suggestions, let me know. There's still the Replay menu for more info. @Ronbon172 Reset is now working with the beta version above. It resets the "Current Stats" because the "Total Stats" I used before are not resettable. just tried beta and reset still not working. also, the time/date was replaced with a lock symbol...not sure about that. as far as the puff counter, i changed the source to "total puffs since reset" and now the puff counter is working and selecting "yes" to reset is working. is there a way after you press "yes" that it goes back to the parent screen? i can't figure that one out.